Grainger Public Relations » Accountancy Team’s Charity Free-fall! Raising funds for Maggie’s Centres, the jump is just one of a year-long programme of fundraising activities and initiatives well underway across their offices in Dundee, Glenrothes, Forfar and Cupar. 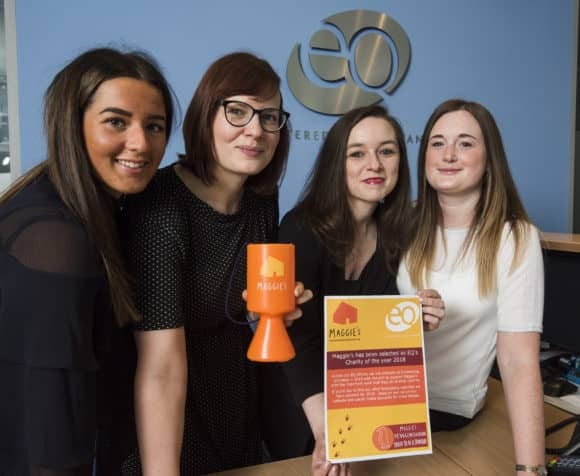 With the exception of sky dive donations, the firm has already raised over £3,500 through a host of endeavours including bake sales, a curry night and pub quiz. The sky dive fundraiser will see the quartet descend by parachute in tandem jumps with professional sky divers on Sunday 10 June 2018, with Rachel Bell (Senior Manager), Katie Edward (HR Assistant), Hannah Grubb (Trainee Accounts Assistant) and Laura Hutt (Marketing Co-ordinator) braving around 30 seconds of free-fall. They will dive through the air at up to 120 miles per hour before the instructor deploys the parachute at around 5,000ft. EQ is also sponsoring a penguin as part of this Summer’s Maggie’s Penguin Parade. For three months during the Summer, starting on Friday 29 June 2018, the streets of Dundee and the surrounding region will be home to a trail of individually designed and beautifully decorated giant penguin sculptures showcasing the wealth of artistic talent in the area, creating economic and cultural benefits for Dundee. The project is led by Maggie’s Centre Dundee, in partnership with Wild in Art, and will raise significant funds to support Maggie’s vital work caring for local people affected by cancer. The EQ penguin will be designed by Ulrika Kjeldsen.